When you purchase a steel arch building the service after the initial sale is the true measure of your building provider’s performance. Our team of experts is dedicated to customer service and making your steel arch building project the satisfying experience you deserve. Your service representative will guide you through the entire project from the purchase of your steel arch building to its completion. We know our business and we have provided quality pre-engineered steel arch buildings to commercial, industrial and agricultural customers for many years. You can count on accurate technical advice and superior customer service from our trained team of steel arch building specialists. Service representatives monitor the progress of all arch steel buildings to properly coordinate the arrival of your building. Community freight and share loading greatly reduce the delivery cost of our steel arch buildings. 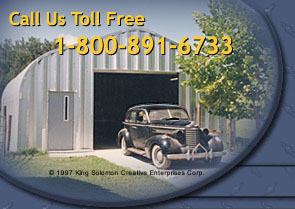 Arch steel buildings are simple to erect and with our technical assistance your project will be complete in no time.